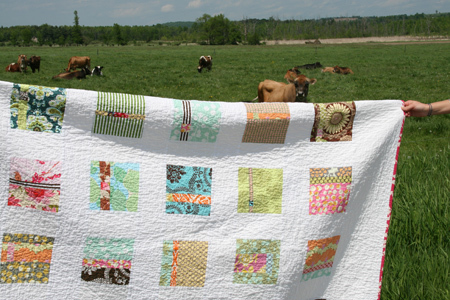 Only in Vermont you’d include cows in your quilt photos, right?! 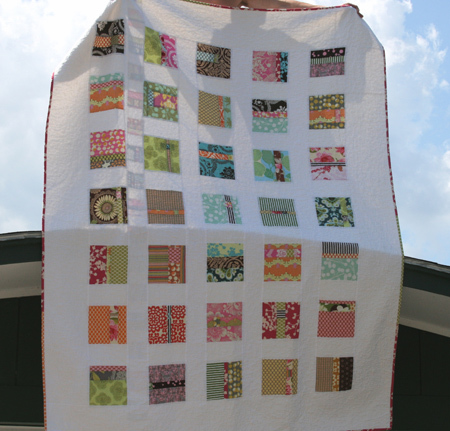 This quilt is made from a lot of Amy Butler fabrics, with some Joel Dewberry and Jennifer Paganelli fabrics mixed in. These are truly the very first fabrics I purchased, way before I knew how obsessed I’d become. Each block is 8″ square, I believe, and each contains three different fabrics. Then all sashed in white. And it’s big! The photos above only show half of the quilt – below is a photo of the entire front. 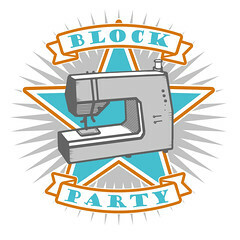 I enjoy looking at this one because I very specifically recall cutting and sewing these blocks, and not really being very sure about my measuring and cutting skills. One block in particular I recall ended up almost an inch smaller, and at the time, I just decided it wouldn’t matter (ha!). Luckily, quilting glosses over many errors! This entry was posted in [search] Other Quilts, 2009 Finished Quilts, Finished Quilts, Household Sewing - bags, napkins, pillows, Posts about Quilts, Quilts. Bookmark the permalink. 62 Responses to I finished my first quilt! Ashley its gorgeous! I love the large blocks and the way you highlight these wonderful prints. Congrats on completing such a large quilt – its got to feel great!! This is so pretty….love all the white with punches of color. 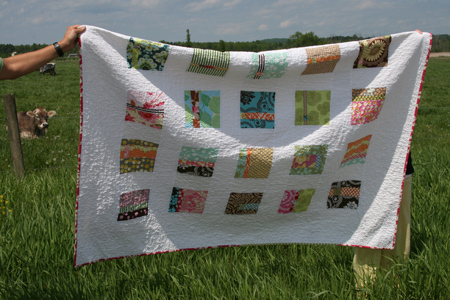 I keep coming back to your blog and looking at the far far away squared quilt…love it!!! 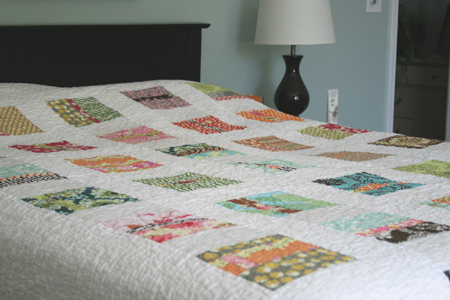 What a great quilt…the fabrics are wonderful…and what an amazing job for your first quilt! ummmmmmmm this was your FIRST quilt top? And you just started 9 months ago?! GOOD FOR YOU!! It is lovely! Congrats…awesome feeling isn’t it to finish something whoo hoo!! Wow! Great choices of fabric and I really like how each block is unique. I can’t believe you only started quilting nine months ago!!! This is gorgeous. BTW, I located some of the fabulous bird fabric. Anyone interested? Email me and I can give you details. Wow – very pretty…Love how the cows are helping you to show it off. LOVE! I love the very skinny strips in the middle of some of them with the small square interrupting it. I’m in the process of fixing and continuing the first quilt I ever started, oh a year ago. Apparently I thought that having things cut the same size or sewn with the same seam allowance would be important! Looks beautiful! Congratulations. It also took me a very long time (over a year) to actually finish the first quilt I ever made. I had the top pieced, but the quilting just took me forever to get around to. Now I’m hooked, although I don’t make as many quilts as I’d like. Gorgeous! Congratulations, and I love love love the colors. So how did you get so good, so quickly? Classes? Amazing machine? Please share your secret(s)! new to your blog and love every post! so inspiring to know that you only started quilting recently. THANK YOU for a wonderful blog. I am stunned that you’ve been quilting for less than 1 year. You are amazingly talented! The quilt is gorgeous, as usual! Fabulous quilt….a work of art I’d say. Fearless use of color and pattern….I am inspired beyond belief….Thanks for sharing….I too….love the cows! Looks wonderful! I can’t believe that was your first, nor can I believe you’ve been quilting under a year. Well done!! I love the cows in the picture 🙂 And the quilt is very nice. great job!!!!! and i like the cows!!!! beautiful! i love the pictures with the cows. It’s beautiful – congrats on the finish! 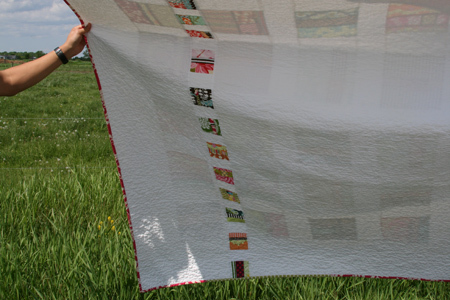 And wow – it’s big too…no wonder it took you so long to work up to quilting it! It looks great, congrats on finishing it up! You got me motivated to finish one of my quilts as well, I just have to sew the binding down and it’ll be done. So, thanks! 🙂 Your dress you made earlier is adorable BTW, so cute! It’s gorgeous, I love the pattern. Funny, I made my first quilt 9 month ago to. Your finished quilt is really gorgeous. I remember this one! Looks beautiful all finished!! WOW! That is a beauty and like the other’s who have posted I am in awe that you have only been quiliting for 9 months! Incredible. Your blog has quickly my favorite! Well, you’re one up on me. Despite the many quilts I have finished in my time, I still haven’t finished my very first quilt. I seem to have a bit of a block on that one. I finished the top about ten year ago and I just can’t seem to pick it up. Anyway, yours is super gorgeous. I’m so impressed at how you made the strip on the back fall so perfectly in line with the sashing strip on the front. I love that quilt, and I can’t believe it was your first one. It is like you were born to quilt. I have never left a comment, but I really love your blog. I have been reading it for a few months and it is very inspiring. I have yet to actually machine quilt one of my own quilts, but I am going to be trying it very soon. I am a little nervous. Well done , another beautiful quilt. Thanks for sharing. I almost never plan a finished size or use when I start a quilt. The only exception to that is a baby quilt, and then I only have a general idea where it’s going to go. Congrats! And may I second (third/fourth/etc) the amazement that you have only been quilting for 9 months?! And gotten married during that time?! You are amazing. You definitely have got a strong sense of style, evident already despite just starting. I really like your use of fabrics in this quilt. DId you make up the pattern too?! Wow, congrats! That’s an amazing first quilt! Congrats – it looks great!! Congratulations on your finish! It’s gorgeous. Sometimes I use smaller than queen size quilts on my bed but I use a solid white chenille cover under them for extra drappage. 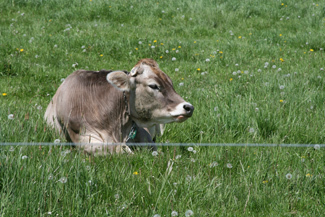 There’s nothing like Brown Swiss cows to complement the crispness of your quilt. (If my memories of growing up on a farm are correct, that’s the name of the type of the cows in the photos, belonging to the “random farmer”) Your comments and photos always make me smile. Thanks for brightening my days. Well done Ashley. I too have my first quilt top unfinished and folded up in my wardrobe. I will be bringing it out now that I’ve learnt so much in my likewise 9 month quilt journey ….we have the same addiction! I also get lots of aches and pains and my physio (who is also a quilter) suggested getting two rubber door wedges and sticking them into the off-side of the machine (the other side from where you face). That way your machine is propped up towards you and you don’t have to stretch your neck and push and pull at funny angles. I haven’t tried it yet but thought I’d pass it on….it makes sense! A fantastic first quilt! I love looking back at my quilts and remembering what was happening at that point in your life. Quilts are so much more than the end product. It is more about the process, from purchasing the fabrics to handsewing the binding, and being reminded of what else was going on at the time. Wow you have created so much in just 9 months. How fantastic! I really love this kind of quilt!! Superb and a great way to showcase your fav fabrics – 2 thumbs up!! It’s gorgeous! And no, you’ll find cows in quilt photos from Wisconsin, too. It’s just that our cows are mostly black and white. Wow – what a great first quilt! I know what it’s like to jump into quilting with both feet – my first quilt was a 90″ x 90″ Trip Around the World. And I haven’t done another one that big in the 15 years I’ve been quilting. Oh, and love the cows! But with such a gorgeous backyard I’d never get tried of seeing it as your photo backdrop. I like how it looks on your bed! So fun to be able to use it now that it’s finished. Great job! Such an impressive quilt and I love that it is so big. Cute cows. That is one beautiful, joyous quilt. And the sister’s photo shoot staging is pretty cool too. 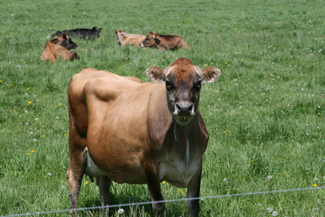 I love cows and everything about them … yes, everything. Congratulations! I love this setting and how you showcase your fabrics. I can’t believe you only quilt for nine month! I can’t believe your first quilt came out so beautifully! And that you only made it nine months ago!!! Whoa!!! I really like this quilt for the simple and elegant layout. The fabrics are beautifully displayed, and the colors glow against the white. You are so talented, and inspiring!! Thank you for sharing the measures. The cows are a wonderful backdrop! Congratuations on your first ever quilt! Very cool quilt! I love the way the colors always seem to pop on a white background! When ever I feel like doing something creative I log on to your site. Your quilts never fail to inspire me. What is the fabric you use for the white parts? Wow, this is so beautiful, and I love the stripe on the back. This is really inspiring to me. GOOD for you! A first quilt, especially this beautiful, is quite the accomplishment; you should be proud of yourself! My 1st quilt is still sitting in a bag in the closet, maybe 1/8th hand quilted. I think I need to pull it out and just machine quilt it b/c I’m just not into hand quilting at all. yay for yours though, it is just great! I love the quilt. Did you use a pattern? Nope, no pattern – just made it up as I went along! Oh my heavens, I have just discovered your blog (via a summer dress pool on flickr) and I am completely in love. 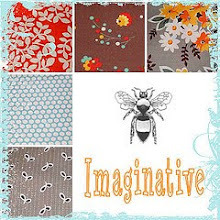 Your eye for design and matching fabrics is wonderful. I have you bookmarked and will be returning often! Thanks for the beautiful inspiration. oh my god it’s GORGEOUS. adding it to my list of inspiration quilts.